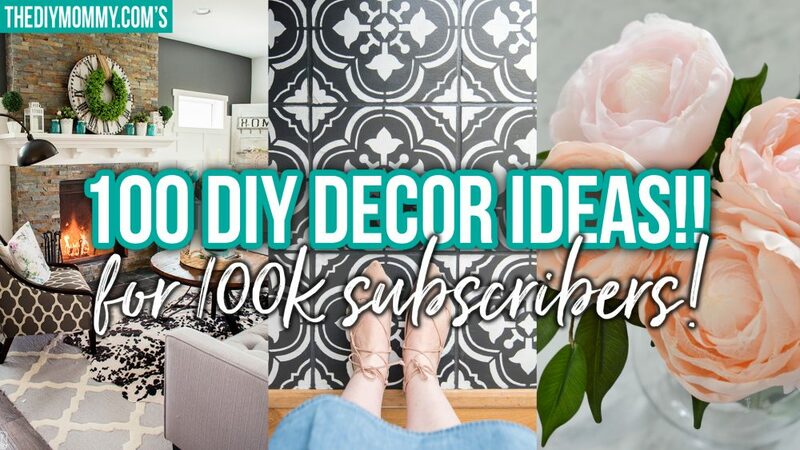 100 Beautiful DIY Decor Ideas for 100k YouTube Subscribers! Last month, I reached 100,000 subscribers on my YouTube channel. I never thought I’d reach this milestone, but I’m so thrilled and grateful that I did! 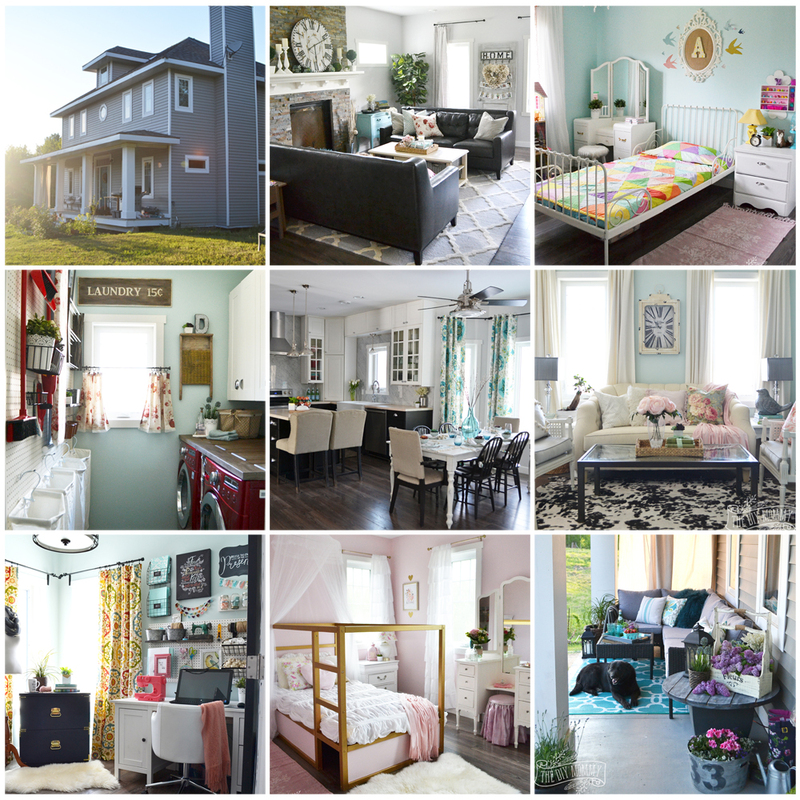 In honour of 100k subscribers, I’m sharing a full 100 of my favourite DIY decor ideas that I’ve featured here on my blog and my YouTube channel over the past few years. You can listen to my thoughts on this exciting achievement in my video below, but I simply need to say THANK YOU. Thank you for reading my blog, for subscribing to my channel, and for encouraging me to create things and share them here with you. I am so honoured to be able to do this full time and meet so many fellow creative mamas all of the world in the process! 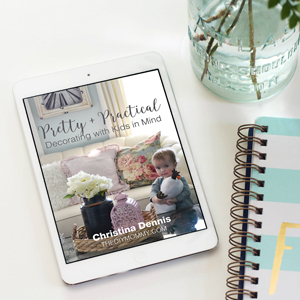 Watch my video on 100 beautiful DIY decor ideas, and then find the list with links to all of the tutorials and projects below! This is a classic pillow design that’s really simple to sew and I still use this method. I made this when my daughters were small, and we still use it. It’s a great heirloom craft! This is a great way to organize your jewelry, and it’s really simple and inexpensive to make. This is a great hack when you want your fan to match your decor. I love board and batten, and this hook wall has been so useful for our family. One of the most popular DIYs on my blog, and I have the entire pattern and instructions on there for free! This is a great way to sew drapes if you’re a beginning seamstress. Another one of my most popular tutorials, and these are fantastic for wedding or Spring decor. Putting together a cohesive but unique gallery wall is so much fun, and I have all the tips on my blog. This is a great way to create inexpensive art for your home – you simply paint right over a thrifted piece! One of my first YouTube videos, this is such a sweet looking wreath for hardly any money! This is a great hack if you want to have an interesting laundry room counter top. This is simple to sew, and a great way to coordinate your ironing board with your decor. I love hook walls, and this projects is fantastic for organizing a kids’ bathroom or entry. This wreath is so cute and easy to make, and I love the addition of the banner. If you don’t want or can’t afford a real cowhide rug, make one out of fabric! It’s so easy. Pegboards are a great way to organize, and I put this one in our laundry room. This is another simple sewing project, and these would be beautiful in a laundry room or over a kitchen sink. These chairs were an inexpensive Kijiji fiind, and I painted them and my mom reupholstered them to give them a beautiful update. My girls and I love to create and play with fairy gardens – these are a wonderful family project. Use an old pickle jar and some mirror spray paint to create a beautiful, vintage look vase. I took some fabric and ribbon and sewed a skirt for my keyboard stand to make it suit my decor. This hack shows you how to create perfect looking chalkboard art even if you aren’t the best at handwriting. These drapes were very inexpensive, and so easy to make to create privacy on our porch. Beefing up your porch columns can be easy and inexpensive with some plywood and paint! This wreath was essentially free because I used clippings from my yard and some twine. If you don’t like to sew, this Christmas tree skirt is the perfect DIY project! Simply find some faux fur and cut it to size. This is one of my favourite decor DIYs – I still use my arm knit blankets everywhere! It’s easy to make wire baskets for any awkward size with some fencing and pliers. Take an antique door, some hooks and some baskets and create an adorable command center for your home. Old mason jars and pipe clamps can create a really handy hanging storage system – I made this for my craft room! Use the top of an old electrical wire spool to make a beautiful oversized clock with paint stencils. This is a twist on my original fabric flower tutorial – it’s fuller, and has a stem. This is my easiest pillow cover tutorial, and they’re so quick to make! If you have a dated, plain filing cabinet you can spruce it up with hardware and paint and make it look stylish and new. Here’s another cutlery tray hack – paint one and turn it into a shelf for your child’s collectibles! 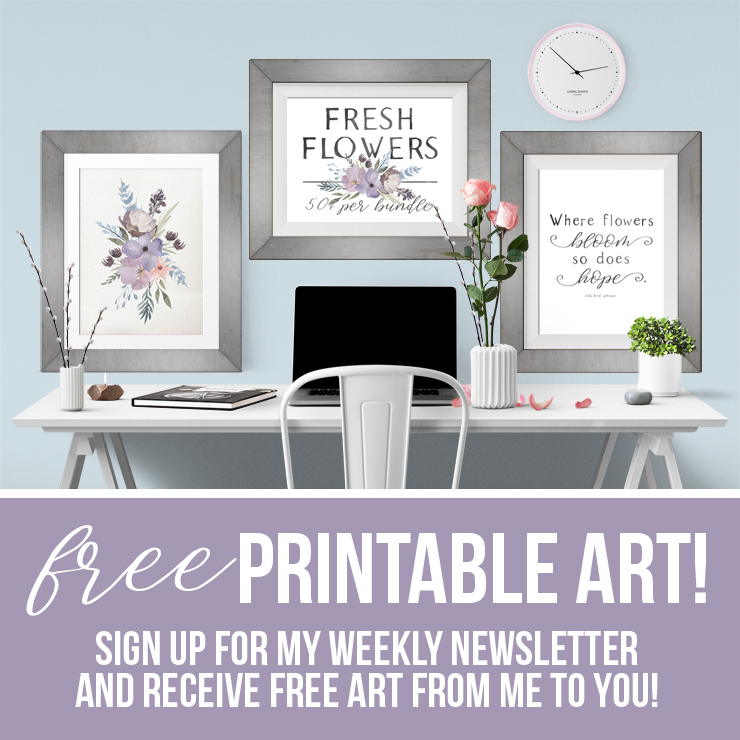 Paint thrifted picture frames with chalk paint and use free printable art to create a romantic gallery wall. I have a great DIY chalk style paint recipe and I share how to update furniture with paint in 3 hours or less! Turn a new galvanized container into one that looks like it’s an antique with an easy paint technique. Plain vases can be turned into something special with lace trim and Mod Podge. Paint rocks with acrylic paint and seal them to create beautiful and unique garden markers. Soft minkee fabric doesn’t fray, so you can cut it to size and create a fringe for an easy no-sew throw blanket. If you turn a duvet cover inside out and roll it with your duvet, you can put them together like magic! Some fabric and a glue gun are all that’s needed to turn a plain black out shade into something that matches your decor. This is a great DIY if you’re a beginning seamstress and want to create a beautiful, traditional covering for your window. I share all of my tips and tricks on how to hang wallpaper like a pro. I love wallpaper! Use an old canvas, a vintage map, paint and Mod Podge to create beautiful, customizable art. I found an antique tire rim and created a unique fall wreath. You don’t have to sew to create a beautiful table runner out of fabric – just use hem tape! Tying some faux greenery and flowers to twine makes a beautiful garland for Fall. A barn door is a beautiful DIY that can add interest to your home and it’s not that hard to install. Inexpensive painters drop cloth fabric can be ripped into strips and applied to a wreath form for gorgeous decor. This hack is an easy way to hang art that will sit straight on your wall – no level required! This simple tying hack creates an easy pillow cover from a scarf for any season. Here’s another DIY hack with hem tape to create a simple no-sewing-required pillow cover! This beautiful Christmas accessory doesn’t require any sewing to make – only drop cloth and a glue gun! If you love the look and feel of faux fur, I’m sharing all of my tips on how to cut and sew with it to create a beautiful pillow cover. Caulking the trim in your home makes it look finished and professional, and I have a few easy tips to make it look good. Use a Cricut machine and some ribbon to add some personalized embellishments to a store bought wreath to make it look special. Adding a clothing rod to a bookcase turns it into an adorable spot to store dress up clothes in your child’s room. This cute banner is made of felt and biased tape. So easy to make and a cute kid’s room decoration! Use barnwood and old logs to create a really easy, free bench for your outdoor decor. These coasters are made with wood slices, and the flowers are made with an inkjet printer and transparency film! Turn an old log into a planter for your succulents with painter’s tape and paint. An inexpensive kids’ table set gets a designer makeover with paint, wallpaper, and sealant. I love the look of board & batten trim, and I share how to install it and finish it to make your home look customized and beautiful. These drapes are easy and quick to sew and feature a tab at the back made out of wide ribbon. I have a great recipe for DIY chalk style paint that can transform furniture in a snap! Glue some faux magnolia leaves to a grapevine wreath to create this iconic farmhouse decor accessory. A thrift store doily turns into a bohemian wall hanging with the addition of a fringe, a driftwood hanger and some faux flowers. Use old tshirts or knit fabric to create chunky yarn to make this easy crochet rug. Turn the unused space under your stairs into a pantry with shelving and a DIY barn door. A tire becomes an ottoman with sisal rope and a glue gun. This is such a simple but impactful DIY! This outdoor couch is easier than it looks to make, and all you need are 2×4’s! This pillow is made of giant, fluffy yarn and a few basic macrame knots and is so soft and cozy! Turn your fall Mum planters into festive Christmas planters with this easy tutorial. I’m sharing all my tricks on how to decorate a Christmas tree with ribbon and make it look romantic and beautiful. Use wood and a stencil to create a beautiful custom sign with a farmhouse look. Another take on an under-stairs nook – turn it into a mini retreat for your pet with a DIY bed, handmade wall organizer, and more cozy accesssories. Paint and elbow grease can transform thrifted nightstands into beautiful pieces that blend in with your decor. Use a Cricut machine, my free file and some iron on vinyl to make this cozy looking pillow for your home. Learn how to make this gorgeous table runner with clothesline and a few basic macrame knots. An old sweater becomes adorable wraps for mason jars that you can fill with gifts or decor items for Christmas. This method of wreath making was passed down from my great grandpa who was a gardener in germany. My mom and I share tips on how to acheive a smooth finish when painting interior doors with a paint sprayer. Combining real and fake flowers and greenery is a great way to create a full flower arrangement on a budget. A heart grapevine wreath a faux flowers create a romantic wreath that’s perfect for Valentine’s Day or any day of the year. I have a sneaky way to hem drapes while keeping them on the rod and not even touching a sewing machine! This adorable banner is a great beginner’s crochet project and it uses chunky yarn so it works up fast! Turn a plain outdoor mat into something more personalized with some paint and a stencil. I used some Ikea fridge cabinets and trim to make a built in bench for my breakfast nook. 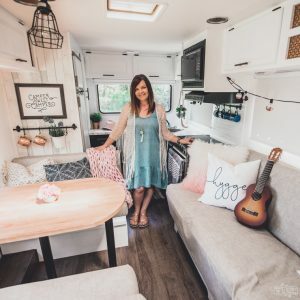 Inexpensive string, large embroidery hoops and fairy lights help create this unique, boho styled macrame chandelier. 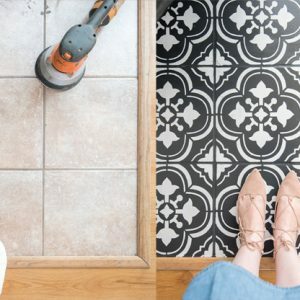 If you have old tile, a fun way to update it is with a stencil, some paint, and a lot of elbow grease to create a whole new look. Another easy crochet project, these cushy chair pads are really quick and simple to make. Some DIY faux peonies and other faux flowers are used to embellish a store bought faux boxwood wreath and give it a Spring makeover. Old wood and paint turns into a beautiful potting bench with the addition of an antique window. This is my favourite pillow cover methhod. It’s a little trickier than the others, b ut it looks so professional! Turn an orange coloured wicker basket into somethin that looks like it was found at a French country market with paint and wax. 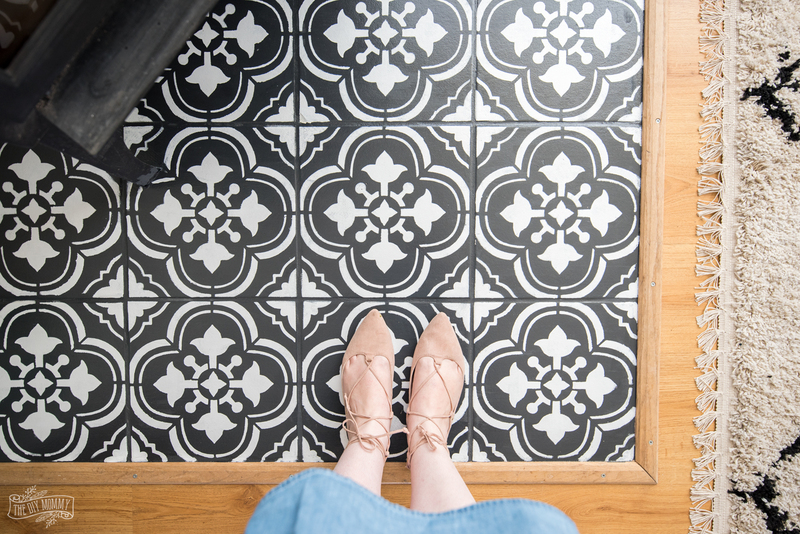 Installing new flooring in your home is a geat way to give it a huge update, and laminate might be easier than you think to install! I share all my tips in this tutorial. You’re an absolute inspiration Christina! Congratulations on the 100K subscribers – completely well deserved. On to 1 million!